I am writing this article to commemorate the 10th death anniversary of Sri Lanka’s top most composer, melody maker, rhythm guitar player & music director Uncle Clarence Arthur Somasinghe Wijewardane. Since his demise more than tribute him some people were forced to destroy his valuable compositions. Even though still his fans are with him forever. Clarence Wijewardane born in Brampton Estate in Haputale on 3rd of August 1943 and started his music career after he settle down in Rathnapura. In 1966 he formed his first band with Charles Senewirathna and Prem Aththanayaka and there wasn’t a name for band. After that Annesly Malawana joined this group and this band was given the name as “The Moonstones” .Then the following mentioned members joined this band. Monti Waththaladeniya (Conga and Cuban Drums), Dammika Wijesiri (Maracas), Sunil Malawana (Bass Guitar/Lead), Upali Ubesekara (Sitar), Ajith Sivananda (Piano), Mangala Rodrigo (Lead Guitar), Chanaka Perera (Bass Guitar) and Wijith Peiris (Drums). Clarence Wijewardane did an experiment as The Beatles did by taking a Sithar player for the Moonstones. In very first beginnings Uncle Clarence harmonize the songs sung by Annesley Malawana. 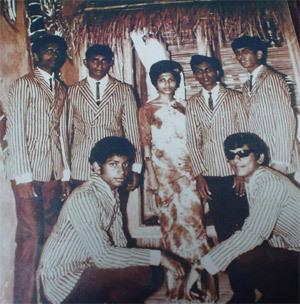 In 1969 Indrani Perera joined the Moonstones as the female vocalist and later Srima joined the band as the female vocalist. She sang the song “Nali Manamali” along with Annesley Malawana. Moonstones was the first band that used electronic technology for local music scene. The popular hits of Moonstones are Sitha Ude, Nali Manamali, Hela Helaine, Gamarala, Rantharuwak, Ma Oba Gana Pathum Patha, Piyaneni, Kusumalatha, Sala Salu Ruwan, Ruwanpure, Mango Nenda, Kalu Mama, Goyam Kapanawa, Rosa Male, Ralahami, Ramani, Dilhani, Sigiriya, Sumudu Mal Pipunu, Gonwassa, Pemkathwawa etc. The last era of the Moonstones, Clarence Wijewardane who performed as a composer and music director became a singer. His first song was Dileepa Podi Puthu that was written by late Mr. Karunarathna Abeysekara. Clarence Wijewardane was practiced to compose songs in a sweet manner by catching the real happenings. For the first time for a recording he used a guitar wah wah pedal for the song Pemkathwawa. Also the song Sigiriya was the first Boss nova beat song in Sri Lanka & later he used this beat for the songs Piyaneni, Mage Palpathe, Muhudu Rella, Renin Piyabanna, Maliniye, Ramya (Previously sung by Clarence in 4/4 beat), Ran Monarun (Winslow Six), Lalitha Kala (Chithra Somapala) etc. Also he used two guitar players to play lead parts & counter parts of songs such as Sumudu Mal Pipinu, Dileepa Podi Puthu etc. For the first time in Sri Lanka he used the blocked guitar tone for the song Kusumalatha. In 1970 he left the Moonstones and held a musical show in Moratuwa with Chanaka Perera and Wijith Peiris and the show was named as “Breakaways from the Moonstones”. 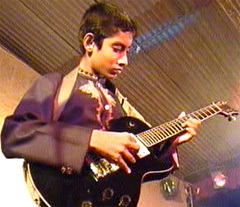 Lead guitar player of the “Becons”, Anton Gunathilake played lead guitar for this musical show. The song “Ran Monarun” (later sung by Winslow Six) was sung by Uncle Chanaka Perera at this concert as a tribute to Aunty Lankika. Due to the success of this musical show they formed a new band. At this time Clarence Wijewardane found a professional lead guitarist at a wedding. He was the maestro Dixon Gunaratne. Also Nihal Perera, Ranjan De Costa, Clinton Fernando joined this band for a short period. Afterthat the band was given the name “Golden Chimes” by Mr. Gerald Wickramasooriya. One of the famous hit songs of The Golden Chimes Kimada Nawe was the first duet song of Clarence Wijewardane and it was the first Cha -Cha beat song in Sri Lanka. (Also he started to sing duets with Indrani Perera, Lankia Perera, Lilanthi Karunanayake, Shami Fonseka, Mariazelle Gunatilake, Chitra Somapala, Menik Chandrika, Samitha Mudunkotuwa, Latha Walpola, Neela Wickramasinghe, Sheril Perera, Dammika Walpola, Chandrakanthi Munaweera and finally with Maya Rodrigo). 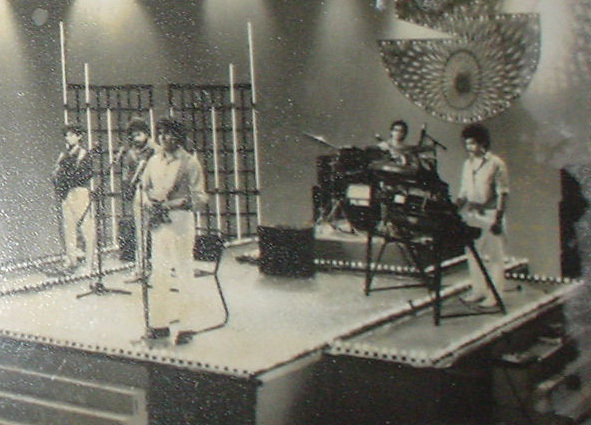 Soon after Lankika Perera joined for the group as the female vocalist also Anil Bharathi as a male vocalist. Clarence composed a song for the son of Mr. & Mrs. Vijaya Corea and it was titled as “Viran Bilindhu Puthe” After that Clarence changed the chorus part of the song and sang that songs as “Kiri Muhuda Kalabala” Also Clarence composed a songs for the son of Chanaka and Lankika Perera and it was titled as “Sihina Pathum Wimane” Also the song “Bethlehempure” which was written by late Mr. Karunarathna Abeysekara became an instant hit. This song was vocalized by Anil Bharathi and Lankika Perera. At that time most of the popular songs have been created. Some of them are Malai Walai (with Lankika), Kiri Muhuda, Muhudu Rella, Sihin Sinawai, Sudu Menike, Bethlehempure, Ada Wei Irudina, Tharikita Thirikita etc. Also he played the traditional drum pattern “Guda Guda Guda Thakita Thakita” by Lead guitar for the song Suragana Wes Wala. Also Clarence Wijewardane entered the Film Music Industry at that time. Also the first film that was music directed by Clarence Wijewardane was Sikuruliya and the music was supplied by the Golden Chimes and there was a scene that Clarence Wijewardane and the Golden Chimes are plying during a party in the film Sikuruliya. Also for the music of the songs of Sikuruliya film, Clarence Wijewardane used western musical instruments as well as eastern musical instruments. The song Wasanthaye Mal Kekulay which was composed by Clarence Wijewardane which consisted in film Sikuruliya was the first song that consists 5 lines in the chorus part of the song. Also he directed music for the films in a different & unique style of his own. In 1972 Clarence Wijewardane and Dixon Gunaratne left the Golden Chimes and they both formed a new band known as Super Golden Chimes also with the support of Annesley Malawana in 1973. Then Sri Kantha Dasanayake (Drums), Rohan Gunawardane (Bass Guitar), Conrad Gunarathne (Bass Guitar), Paul Perera (Keyboards), Liyasing De Silva (Bass Guitar), Rukshan Perera (Keyboards), Nimal Perera (Drums), Sunil Malawana (Bass Guitar), Chandral Fonseka (Bass Guitar), Sooriyakumar Wieerasinghm (Keyboards), Peter Almeda (Bass Guitar), Cumar Peiris (Keyboards), Nimal Punchihewa (Drums and Conga) joined for the Super Golden Chimes from time to time. And revolution of the Sri Lankan music field has been happened during that time. Clarence Wijewardane showed his outstanding skills during this time. 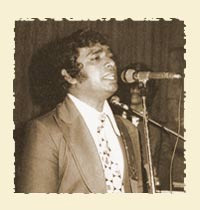 He composed and directed music a song named as “Maha Balwathune” for the non-align conference held in 1975 in Sri Lanka. Also he composed and directed music a song for the SARRC Conference as well. At the same time he sang the song “Duwani Sirima” when Hon. Former Prime Minister Mrs. Sirimavo Bandaranaike arrived as the chief guest for the opening ceremony of Ceramic Cooperation. Also Super Golden Chimes supplied music for that opening ceremony. Clarence Wijewardane certificated as the most popular composer in Sri Lanka for the years 1974 and 1976 by a pop poll conducted by Pop and Teen Fanfare. The song “Kataragama” which was composed by Clarence Wijewardane also certificated as the best song in Sri Lanka for the year 1974 by a pop poll conducted by Pop and Teen Fanfare. Also Clarence was the person who composed most number of songs for Kataragama God. 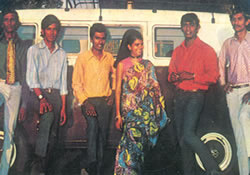 As well as Super Golden Chimes was also certificated as the most popular Sinhala Pop Band in Sri Lanka for the years 1976 by a pop poll conducted by Pop and Teen Fanfare. The Pop and Teen Fanfare was sponsored by the Times Group of Newspapers. During this time he composed number of famous hits such as Seetha Sulangak, Mahaweli Mahaweliye, Seetha Manik Ganga, Upandine Ada, Pibidena Mal, Mama Dhutuwa, Mata Hamuwee Oba, Olu Mal Pokune, Ruwan Wala, Mama Awemi, Mal Cheeththe, Lowa Sethapila, Mahalu Wiye, Kandasuriduni, Udarata Niliya, Pena Bubulai, Maniyanee, Muwa Hasareli, Andhura Ira etc. 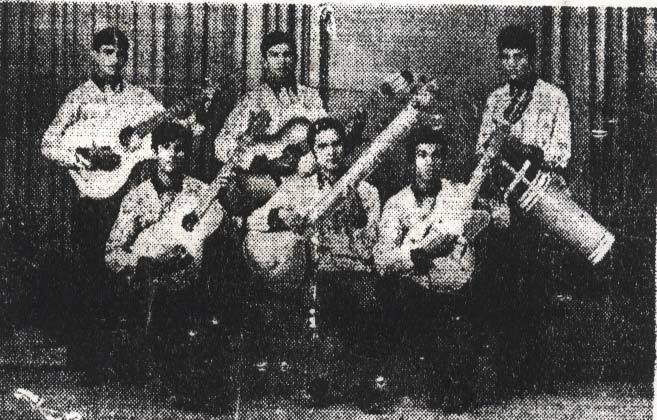 Numbers of internationally trusted musicians were produced through “The Moonstones, The Golden Chimes & The Super Golden Chimes” bands. Also he used a traditional dancing pattern for the song Udarata Niliya played by the Lead guitar. Also for the first time he used western drums foot breaks for the song Gamen Liyumak. Also I have seen in many papers that young musician has said that his songs were featured in BBC for the first time from Sri Lanka but I thoroughly say that Clarence Wijewardane was the first person to featured along in the BBC in 1975. Then Clarence Wijewardane started to sing for the Sinhala films under other music directors. Some of them are Udarata Maniketa (Sihasuna), Kolomba Sanniya (Kolomba Sanniya), Loke Jeewathwannata and Suwadak Danewi (Janaka Saha Manju), Male Male Nuba Nadan (Sivuranga Sena) etc. Also he provided background music for the film “Mangala”. After that again he directed music for the film “Apeksha” which was a great success. As a new job he redirected music for the songs of Rukmani Devi. They were Dedikala Matha, Mewila Penewi, Danno Budunge, Siri Buddagaya (with Pandit Amaradewa) and as well as he directed music a new song for Rukmani Dewi. That was Pem Raja Dahane (with Milton). As well as he composed a song titled as “Dayabara Daya” as a tribute to the photographer of Nelu Studio. Also he redirected music for eight songs of the Chitra Somapala. Also he directed music for 6 songs of C.T. Fernando which were vocalized by Priyantha Fernando and he directed music for six new songs for Priyantha Fernando. During Super Golden Chimes era he introduced a new child vocalist and she was Lilanthi Karunanayake. He directed music for children’s songs that were vocalized by Lilanthi Karunanayake. Some of them are Konde Digata Dala, Kiyanna Sulage, Punchi Punchi Bonikko, Kolomba Nuwara, Podi Kale, Hisa Bokutui etc. At present these song are very popular and according to my knowledge currently these songs are used to sing for the concerts that are held in pre-schools and as well as for the children’s T.V. and Radio programmes. As well as the song Nalawenawa Ma Ukule which is sung by T.M. Jayarathna and Neela Wickramasinghe is also used to sing in pre-school concerts. He pioneered to introduce the first Cassette Tape to Sri Lanka. It was produced under “Tharanga” label he inserted some songs of Milton Mallawarachchi such as Saden Eha, Sandaluthale etc. Firstly Cassette Tape was known as “Any Time Any Where” After that in 1979 Clarence Wijewardane left the Super Golden Chimes and started a solo carrier. After that he joined the Sing Lanka Ltd. and acts as the General Manager of Sing Lanka Ltd. 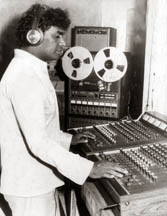 Sing Lanka recording studio was the first recording studio in Sri Lanka that the recordings were done with multi tracks and Clarence was the pioneer to introduce this recording studio. During that time he directed music for number of artists in Sri Lanka. Also he produced a cassette tape named “Clarence with the Rising Stars”. Desmond Rodrigu, Mervin Mihidukula, Sri Kantha Dasanayake, Hilda and Kamal Swarnathilake vocalized that cassette tape. During his lifetime he directed music for artists more than 115. From them he has composed 75% of them. According to my knowledge he has been directed music for more than 1000 songs. Also he has composed and directed songs for more than 115 artists. The artists are Annesley Malawna, Indrani, Irangani and Mallika Perera, Srima, Milton Mallawarachchi, Priyanthi Senaratne, Lankika Perera, Anil Bharathi, Jagath Dewapriya, Lilanthi Karunanayake, Shami Fonseka, Mariazelle Gunathilake, Anjaline Gunathilake, Maxell Mendis, M.S. Fernando, Pandit Amaradewa, Rukmani Dewi, Chitra / P.L.A. Somapala, Milton Perera, Lata Walpola, Raj Senewirathna, Priyantha Fernando, Mervin Mihindukula, Sri Kantha Dasanayake, Hilda, Kamal Swarnathilake, Wijitha Raj Kandalama, Menik Chandrika, Nelson Fernando (U.S.A.), Nihal Nelson, Mervin Perera, Freddie Silva, Sanath / Malkanthi Nandasiri, Manik Perera, Chandhani Hettiarachci, Athula / Samitha, H.R. 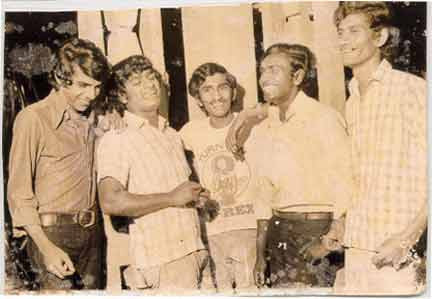 Jothipala, Sujatha Aththanayake, Menik Kurakulasooriya, Jackson Anthony, George Senanayake, Malani Bulathsinhala, Delrin Arnolda, T.M. Jayarathna, Desmond Rodrigu, Priya Sooriyasena, Neela Wickramasinghe, Damayanthi Jayasuriaya, Punsiri Soysa, Greshion Jayamaha, Greishon Ananda, Sheril Perera, Vernon Perera, A.E. 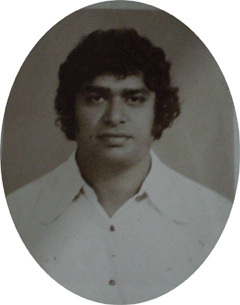 Manoharan, Rani Joseph, Paul Fernando, Desmond De Silva, A.M.D Raj, Jagath Kulasinghe, Saman De Silva, Rohana Siriwardane, Roy Peiris, Winslow Six, Shakila Fernando, Lalith Ponnamperuma, M. Risvi, Chandral Fonseka, Theja Samarasundara, Yapa Ariyarathna, Chandana Dissanayake, Ranil Mallawarachchi, Anton Bandara, Thunders Music Band, Saman Jayantha, Sudesh Fernando (Italy), Neranjan Peiris (Italy), Ajith Gomas (Canada), Ananda Perera and Siha Shakthi Music Band, Ranjan Ramanayake, Anoja Weerasinghe, Alexin Perera, Senaka Heendeniya, Wasanthi Kularathne, Mervin Joseph, Rohini Kuruppuarachchi, Sujiva, Upali Udaya, Ramani, Nilmini Abeygunawardane, Saman Pathirana, Janitha Marasinghe, Kamal Chithrasena, Tyron, Sardha (England), Dammika Walpola, Anoma, Sanjeewa Silva, Chandrakanthi Munaweera, Daya Silva, Thamara Nirosha, Rodni, Royston Fernando, Jayantha Fernando and finally for Maya Rodrigo and Jagath Wickramasinghe for the Yowun Sihina cassette tape. If any of the artists in this list get in to stage to perform, definitely the audience will request a song which is music directed by Clarence Wijewardane. He formed the band “Madhara” in 1985 with Rookantha Gunatilake (Keyboards), Mariazelle Gunatilake (Keyboards/Female Vocals), Raju Bandara (Lead Guitar), Keneth De Silva (Bass Guitar), Prabath Bandara (Lead Guitar), Ajantha Dhampa Gamage (Drums) and rest of the other members. During that he composed and directed music for number of songs. Also he vocalist songs under other music directors as well. They are Dr.Premasiri Kemadasa, Stanley Peiris, Rookantha Gunathilake, Claude Fernando, Somadasa Elvitigala, H.M. Jayawardane, Rohana Weerasinghe, Upali Kannangara and Sangeeth Nipun Sanath Nandasiri. Also he vocalist songs which was composed by other composers. They are Rev. Marceline Jayakody, Karunarathna Abeysekara, Dharmasiri Gamage, Dr. Ajantha Ranasinghe, Camillus Perera, Upali Danawalawithana, Kularathna Ariyawansha, Siril A. Seelawimala, Rookantha Goonatilake, Thilaka Rajapaksha, Vernon Perera, Dharmadasa Kaldera, Kithsiri Nimalashantha, Upali Ubesekara, Subashini Jayamaha, Shelton Weerarathna, Praneeth Abeysundara, Hemasiri Halpita, Ananda Padmasiri, Melroy Dharmarathna, K.D.K. Dharmawardana, Godwin De Silva, Hector Wijesiri, Sarath Galappaththi, Lakshman Ransinghe, Sarath Munasinghe, Dolton Alwis, Saman Chandranath Weerasinghe, Jayathissa Boralugoda, Premakeerthi De Alwis etc. Also Clarence Wijewardane has done his recordings at best recording studios & under the best producing labels in Sri Lanka. They are Philips, Sooriya, Lotus, Gemtone, Tharanga, Silver Lines, Shan, New Sound, Gypsies, Sawsiripaya, Sing Lanka, NAC, Ogi and Torana. All the members of his four bands played for Clarence’s recordings. Other than them the following mentioned music directors and players played for Clarence’s recordings. Claude Fernando (Keyboards), Victor Wijayantha Perera (Shenai), M.K. Rocksami (Violin), V. Hemapala Perera (Flute), Rohana Weerasinghe (Santhur), Stanley Peiris (Saxophone), Premanath Kodithuwakku (Percussion), Laurens Manricks (Keyboards), Duncan Clyde (Drums), Ernest Soyza (Lead Guitar), Upali Kannangara (Lead/Rhythm Guitar), Mahinda Bandara (Lead Guitar) Sarath De Alwis (Accordion / Keyboards), Nesel Thyagaraja (Conga), Jagath Kulasinghe (Drums), Raju Jayakody (Keyboards) , Prasanna Rosa (Lead Guitar), Senaka Ranasinghe (Lead Guitar), Neil Warnakulasooriya (Lead Guitar), Jagath Dewapriya Peiris (Lead Guitar), Athula Adikari (Keyboards), Augstine Fernando (Lead Guitar), Sangeeth Wickramasinghe (Keyboards), Amal Silva (Bass Guitar), Mahinda Silva (Drums), Darrel D Melder (Bass Guitar), Asoka Peiris (Keyboards), Sebastian (Trumpet), Lalith Gunasekara (Rhythm) etc. When the Sri Lankan Cricket team got the chance to play for the test cricket matches in 1982 Clarence Wijewardane produced a cassette tape that contains songs regarding Cricket. Also Nihal Nelson, Vernon Perera, Mariazelle Gunathilake, Freddie Silva, Saman De Silva and Clarence vocalized this cassette tape. Also Clarence Wijewardane produced a cassette tape that contains songs regarding with art stories which were published in art stories papers. Some of the songs which contained in that cassette tape were Weera Unico (Clarence), Nadi (Clarence), Thatu Siduna (Milton), Ran Kuruminiyo (Mariazelle) etc. After directing music for the films Sikuruliya and Apeksha, again Clarence Wijewardane directed music for the films Chathu Madura, Hello Shama and Chalitha Rangali as well as he produced the film Chalitha Rangali with Geetha Kumarasinghe and Freddy Silva. Once he provided music for the Colombo North (Thotalanga) pandal for the Vesak festival. Then Clarence Wijewardane directed music for the tele dramas Susima and Nidikumba Mal. He was the composer and the music director for all the six songs of Susima tele drama. During this time he got a special chance. That he was able to compose and direct music for Pandit Amaradewa. That song was Sasara Gewa Yana Diwi Gamane which contained in tele drama Nidikumba Mal. Also he composed and music directed a song which says about child abuse and other prohibited things happen in present society. That song was “Daesawan Dase” which contained in the Sihiwatana II Cassette Tape. When the royal tusker of the Temple of Tooth Relic passed away Clarence Wijewardane composed and music directed a song about the royal tusker and it was named as “Kandu Sikarin Wata Senkadagala Pura”. It was vocalized by the Ananda Perera who was the leader of the Siha Shakthi music band. Also Clarence Wijewardane became famous for his melodious and catchy jingles. These jingles were Elasto, Bata, Astra Margarine, Bristol Cigarettes, Arpico, Dot Toffee, Singer, Edna Chocolate, Thultex, Ice-Cream Soda, Development Lottery, Dasuna Cartoon Paper, Atlas pens, Orex pens, Building Material Co-operatios (In Sinhala & English), Keels and Health Joy Soap etc. The song “Sigiri Ru Ladun Paradai” which he composed for the beauty queen contest became an instant hit. Also Clarence has composed and directed music for number of songs for the daughters and sons of his friends and relatives. Some of them are Dilhani, Dileepa Podi Puthu, Viran Bilidu Puthu later became Kiri Muhuda, Kalpani Duwanee, Ramani, Wathsala, Duwe Harshani, Duwa Ma Wage, Duwa Roshi, Jayanadi Duwe, Mage Surathal Podi Duwa, Du Anjali, Du Sonali, Amila Duwe,, Kiri Muhuda, Dilshan Puthe, Nohadanna Podi Puthuni, Mage Kuda Puthu etc. Also Clarence has composed and directed music for number of Christmas songs. Some of them are Tikiri Tikiri, Judayawe Siriyawai, Kiri Bilinda, Mihiri Naththale, Seetha Sulange, Issara Dawasaka Bethleheme etc. After the Clarence Wijewardane’s demise his best friends launched a memorial foundation for Clarence Wijewardane but now it in an inactive state. Because of that I think if there will be a strong and a sustainable memorial foundation for Clarence Wijewardane in the future the rest of creations that are created by him in hard manner can be protected. During the life time Clarence Wijewardane who known as the father of Sinhala Pop Music industry in Sri Lanka performed as a musician in Sri Lanka in greatest manner. Even today the popularity of the songs composed by him still remains as it was in the past & I think for the future also it would be same. Some of the songs music directed by him such as Komalaliya (Sikuruliya), Sihin Sinidu (3 Sisters), Sanda Thaniwela Ahase (Apeksha), Soduru Gunathi Mawage Adare (Hello Shama), Sasara Gewa Yana (Nidikumba Mal) were some of the must awarded songs but it was the failure of the authorities for not awarding these songs. Today the youngsters like very much for the compositions of 70’s era. But today some Medias have failed either to broadcast or telecast these evergreen songs through their channels. Some of the guitar & keyboards tones consisted in his music directions are marvelous as well as melodious. When considering about his music directions I can’t imagine how he did those things in his own. There’re number of web sites which contain lot of information about the bands such as The Beatles, The Eagles, The Shadows etc. But up to date there is no website which contains the auto biology of this master music maker. So it is very difficult to get much information about Clarence Wijewardane especially for his fans living overseas. It is much proud to see “The Golden Chimes” band which was originated by Uncle Clarence still in existence for more than 35 years. My father has protected all the original records of Golden Oldies of 70’s era & I gave some of those copies in CD format to Aunty Sheela Wijewardane due to a special request done by her. At the same time I pay my respect to his dear wife Aunty Sheela and his daughter Amila Wijewardane. The world had only one Clarence Wijewardane and I think the future will also be the same. May his soul rest in peace! Clarence gana liyauna ita wadagath article ekak. Meya tamunge wayasata wedi yamak karala tiyenawa sangeetha loke rajatuma wenwen. Honda anagathayak. This is a great article. Clarence is the greatest musician ever. A great article!! All the best for your future son. nice work brother,keep on going! very well done rukshan,thank you ever so much!i was wondering all these time how on earth we could'nt have clarence w's fan club,after all what he have given to this world, beautiful chimes for ever and i wish you all the best in every way!keep it up son!!!!! RUKSHAN WELL DONE. BY THE WAY WHERE IS THIS ARTIST LALITH FERNANDO? DOES HE STILL SING? Dear Rukshan, You have done a great job by exposing all these information about one of the greatest musicians ever produced by mother Sri Lanka. I wish you good luck!! !